lt;stronggt;LEX35S5700lt;/stronggt;lt;BR/gt;Lexmark MX310dn Multifunction Laser Printerlt;BR/gt;Improve your print, scan and copy speeds by taking advantage of this network-ready laser printers robust memory and processor. Fast first-page-out and page-per-minute speeds help you be more productive and efficient. Produce crisp images and graphics, thanks to the high print resolution. 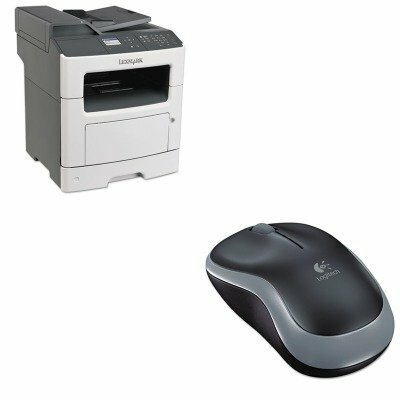 Automatic two-sided printing and Eco Mode feature allow you to save paper and supplies. Print Technology: Laser Maximum Print Speed Black: 35 ppmNetwork Ready: Yes.lt;BR/gt;lt;BR/gt;lt;stronggt;LOG910002225lt;/stronggt;lt;BR/gt;Lexmark MX310dn Multifunction Laser Printerlt;BR/gt;Simple and reliable mouse is contoured for comfort. Features 2.4GHz wireless technology with virtually no delays or dropouts. The on/off switch and smart sleep mode help the battery last up to one year. Nano receiver stays in your USB port for safe-keeping. Connector/Port/Interface: Nano Receiver Left/Right Hand Use: Left/Right.